:nya: Finally, I made another wallpaper ^^. Dun ask me about tht Korean word, coz I dunno wht's tht mean too ^^. I add Lavi, b/c they 3 used to be together lol. Kyaa! This wallpaper is really cute like the title says. 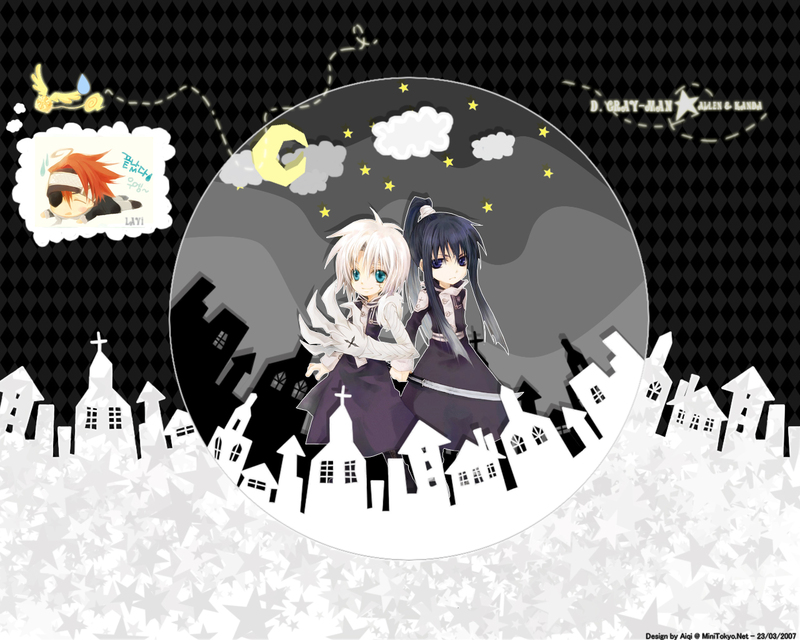 Love it a lot...this is one of my fav DGM wallpapers. eeek! >///< so cute! loving it! nicely done! very cute~! i think it can be a little cleaner like the moon because of the edges, but i still love it! the korean says "finished sob~" and also very cute ^.^ but the dotted line disappears at top then reappears? Awwwwwwwwwww, it's so cute! I love Ravi in the corner. It's my fav part of the piece. Great work on the little town. Love it. Allen x Kanda Bansai! ! !